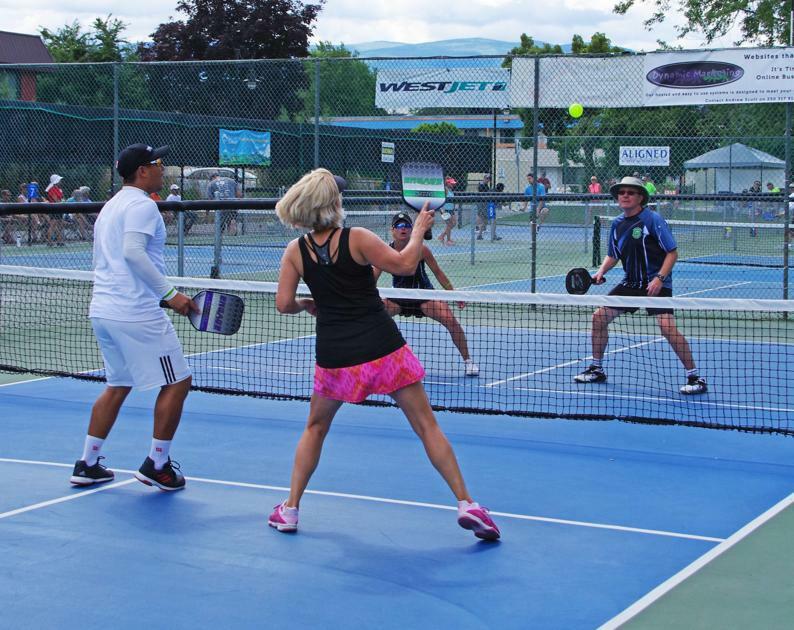 Some 430 pickleball players from across Canada, England, Mexico and throughout the United States were serving, volleying and smashing Friday through Sunday at the Canada National Pickleball tournament hosted by Pickleball Kelowna. Matches were played at Parkinson Recreation Centre on 12 dedicated pickleball courts and another 16 temporary courts were converted for the tournament from tennis courts. Bryan Jackson, who directed the tournament with his wife Glenda, said the event brings attention to how fast the sport is growing to Kelowna's parks and recreation department for future planning for courts as the sport continues to grow in popularity. Pickelball, described as a hybrid of tennis and badminton, is well over 50 years old. "Without a doubt, it's the fastest growing sport in North America," said Jackson. While any age can play pickleball, the sport is popular with seniors and retired people who are not able to play tennis, racquetball and squash as they used to, but still want to socialize and play racquet sports. Each tennis court can hold four pickleball courts, and the smaller court means there is less area for players to cover. Jackson said he's noticing the younger generation is starting to pick up on pickleball and it's is now played in schools. "It's a very easy sport to learn, "said Jackson. "In a matter of 10 minutes you'd be able to volley back and forth." Games are very short, he added, 10 to 15 minutes. This is the fourth year for the tournament in Kelowna and it gets bigger and better every year, said Jackson. This year it drew 250 people from out of town bringing their tourist dollars into the valley. Eric Arvano from Vancouver and his mom Mary Ann from Campbell River were partners in the mixed doubles tournament Saturday. Eric has been playing pickleball for about three years after his parents introduced him to the game. He plays with both his mom and his dad and enjoys it as an activity the family can play together. The family has been competing at the national tournament for three years and coming to Kelowna to play pickleball together is like a vacation. . The stands around the pickleball courts were filled with spectators gasping at daring shots and applauding fine plays. Trish Willis, who recently started playing pickleball, came to the tournament solely as a spectator to see experienced players in action. "It's fun," said Willis. "It's really interesting to see the variations between the different levels of play. It's encouraging, makes me want to play more." Brenda Martel and Dave McLure are cousins born the same day in the same years. The hadn't seen each other for decades until they recognized one another at pickleball a few years ago. Now the cousins, or twins from different mothers as they jokingly call themselves, are pickleball partners. They play for the laughs, the exercise and to stay young.